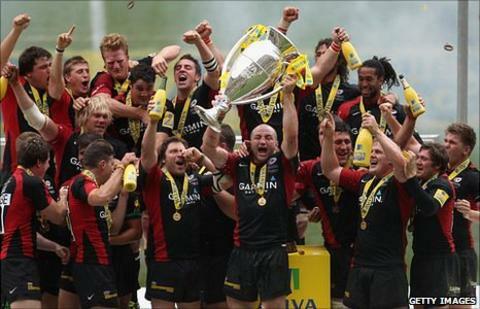 The opening round of the 2011/12 Aviva Premiership fixtures will see champions Saracens begin the defence of their title against six-time winners Wasps. London Irish face Challenge Cup champions Harlequins in the second London double-header on 3 September. Last season's beaten finalists Leicester are at home to Exeter Chiefs. Bath travel to Newcastle and Worcester host Sale while Northampton and Gloucester, last term's defeated play-off semi-finalists, meet on Sunday 4. The opening rounds of the new Premiership campaign will be without its brightest stars who will be involved in the Rugby World Cup in New Zealand during September and October. But the first round of fixtures has produced some interesting match ups. Wasps' new coach Dai Young, charged with turning around the club's ailing fortunes, will face a tough start against his side's fiercest rivals Saracens when they meet at Twickenham. Sarries begin their defence in the second of the London double headers after the Exiles have faced Harlequins - two sides who both had disappointing domestic campaigns last time around. Exeter will be hoping to go one better when they travel to Leicester after giving the Tigers a real scare at Welford Road last year. Newcastle, who narrowly avoided relegation last season, will face a Bath side moulded by new director of rugby Sir Ian McGeechan. Worcester, who return the Premiership after a one-year absence, have been drawn against Steve Diamond's revamped Sharks. But potentially the pick of the round is on Sunday 4 September when losing Heineken Cup finalists Saints welcome Gloucester, who were just pipped to last term's Premiership final by the eventual winners.